Who is the Glenwood Child Angel? 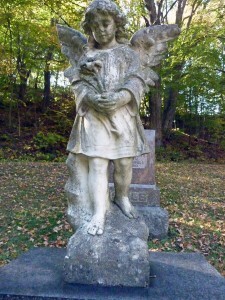 The barefoot child angel is gray from her long vigil. But the real little girl she watches over has an unforgettable story filled with anger, love, grief and powerful omens. She’s just a young thing in a short dress standing barefoot through the coldest winter storms, clutching a marble blossom to her marble breast. 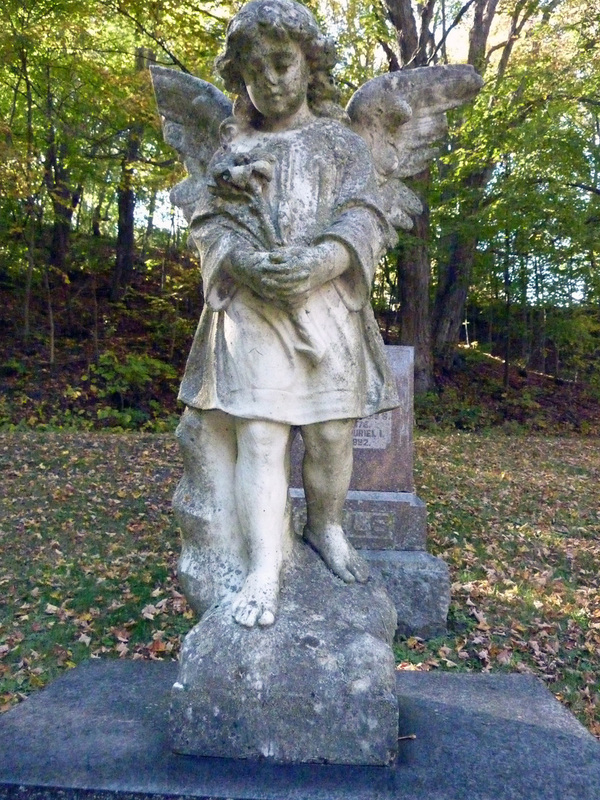 A child angel in a far corner of the Glenwood cemetery, looking puzzled but dutiful atop her large black stone base. Her snowy whiteness is grayed with age. One of her wingtips is broken away. Her tombstone, without date or verse, has only a single word: “Guest”, A family name? Or that she is but a guest here until a better time? The angel migh t be long forgotten except for the tale her brother brought himself to tell over half a century later. Six year old Ruth and her brother, Azel, lived near the cemetery and often played there. One day, in the nearby monument maker’s yard, Ruth spotted the dazzling angel perched on her polished black block. She was so carried away with wonder she insisted she must have it. When her brother informed her it was only for dead people, she was not deterred. Azel told their mother who paled with shock and immediately prayed her daughter would be spared. Months later, the family planned an outing to Napanee in their brand new motor car. The children were so excited they could hardly sleep. Their disappointment could not be described when, in the morning, their mother abruptly announced the trip was cancelled. She had dreamed of six black horses drawing a hearse into the cemetery. Little Ruth lay inside. Mother’s resolve, however, could not hold out against the pleas of her tearful brood. In high spirits, they set out. At Desoronto, they shouted for a stop at an ice cream stand. While running across the road to get her cone, Ruth was struck by a car and tossed into the air before the eyes of her horrified family. She died shortly after in the hospital. Ruth got the child angel she admired so much. Decades later, Azel revealed the story of the broken wingtip. So angry was he about his little sister’s death and his own inability to save her that day that he slipped into the cemetery and hurled a rock as hard as he could at the monument. The rock bounced off the angel’s forehead and cracked a chunk from her wing. The wounded wing remains today, attesting through time to the love and grief and powerful omens of Ruth’s family. Fabulous website, Gail. Is it true that you are going back to writing romances? Maybe I should do that too–or would that be copying? Next Next post: Vampires: Have They Really Thought it Through?